For Baidu's autonomous vehicle Apollo project, see Apolong. The Apollo program, also known as Project Apollo, was the third United States human spaceflight program carried out by the National Aeronautics and Space Administration (NASA), which succeeded in landing the first humans on the Moon from 1969 to 1972. First conceived during Dwight D. Eisenhower's administration as a three-man spacecraft to follow the one-man Project Mercury which put the first Americans in space, Apollo was later dedicated to President John F. Kennedy's national goal of "landing a man on the Moon and returning him safely to the Earth" by the end of the 1960s, which he proposed in an address to Congress on May 25, 1961. It was the third US human spaceflight program to fly, preceded by the two-man Project Gemini conceived in 1961 to extend spaceflight capability in support of Apollo. 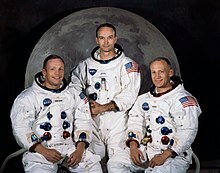 Kennedy's goal was accomplished on the Apollo 11 mission when astronauts Neil Armstrong and Buzz Aldrin landed their Apollo Lunar Module (LM) on July 20, 1969, and walked on the lunar surface, while Michael Collins remained in lunar orbit in the command and service module (CSM), and all three landed safely on Earth on July 24. Five subsequent Apollo missions also landed astronauts on the Moon, the last in December 1972. In these six spaceflights, twelve men walked on the Moon. Apollo ran from 1961 to 1972, with the first manned flight in 1968. It achieved its goal of manned lunar landing, despite the major setback of a 1967 Apollo 1 cabin fire that killed the entire crew during a prelaunch test. After the first landing, sufficient flight hardware remained for nine follow-on landings with a plan for extended lunar geological and astrophysical exploration. Budget cuts forced the cancellation of three of these. Five of the remaining six missions achieved successful landings, but the Apollo 13 landing was prevented by an oxygen tank explosion in transit to the Moon, which destroyed the service module's capability to provide electrical power, crippling the CSM's propulsion and life support systems. The crew returned to Earth safely by using the lunar module as a "lifeboat" for these functions. Apollo used Saturn family rockets as launch vehicles, which were also used for an Apollo Applications Program, which consisted of Skylab, a space station that supported three manned missions in 1973–74, and the Apollo–Soyuz Test Project, a joint US-Soviet Union Earth-orbit mission in 1975. Apollo set several major human spaceflight milestones. It stands alone in sending manned missions beyond low Earth orbit. Apollo 8 was the first manned spacecraft to orbit another celestial body, while the final Apollo 17 mission marked the sixth Moon landing and the ninth manned mission beyond low Earth orbit. The program returned 842 pounds (382 kg) of lunar rocks and soil to Earth, greatly contributing to the understanding of the Moon's composition and geological history. The program laid the foundation for NASA's subsequent human spaceflight capability and funded construction of its Johnson Space Center and Kennedy Space Center. Apollo also spurred advances in many areas of technology incidental to rocketry and manned spaceflight, including avionics, telecommunications, and computers. The Apollo program was conceived during the Eisenhower administration in early 1960, as a follow-up to Project Mercury. While the Mercury capsule could only support one astronaut on a limited Earth orbital mission, Apollo would carry three astronauts. Possible missions included ferrying crews to a space station, circumlunar flights, and eventual manned lunar landings. The program was named after Apollo, the Greek god of light, music, and the sun, by NASA manager Abe Silverstein, who later said that "I was naming the spacecraft like I'd name my baby." Silverstein chose the name at home one evening, early in 1960, because he felt "Apollo riding his chariot across the Sun was appropriate to the grand scale of the proposed program." In July 1960, NASA Deputy Administrator Hugh L. Dryden announced the Apollo program to industry representatives at a series of Space Task Group conferences. Preliminary specifications were laid out for a spacecraft with a mission module cabin separate from the command module (piloting and reentry cabin), and a propulsion and equipment module. On August 30, a feasibility study competition was announced, and on October 25, three study contracts were awarded to General Dynamics/Convair, General Electric, and the Glenn L. Martin Company. Meanwhile, NASA performed its own in-house spacecraft design studies led by Maxime Faget, to serve as a gauge to judge and monitor the three industry designs. 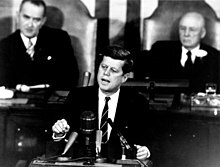 In November 1960, John F. Kennedy was elected president after a campaign that promised American superiority over the Soviet Union in the fields of space exploration and missile defense. Up to the election of 1960, Kennedy had been speaking out against the "missile gap" that he and many other senators felt had developed between the Soviet Union and United States due to the inaction of President Eisenhower. Beyond military power, Kennedy used aerospace technology as a symbol of national prestige, pledging to make the US not "first but, first and, first if, but first period." Despite Kennedy's rhetoric, he did not immediately come to a decision on the status of the Apollo program once he became president. He knew little about the technical details of the space program, and was put off by the massive financial commitment required by a manned Moon landing. When Kennedy's newly appointed NASA Administrator James E. Webb requested a 30 percent budget increase for his agency, Kennedy supported an acceleration of NASA's large booster program but deferred a decision on the broader issue. On April 12, 1961, Soviet cosmonaut Yuri Gagarin became the first person to fly in space, reinforcing American fears about being left behind in a technological competition with the Soviet Union. At a meeting of the US House Committee on Science and Astronautics one day after Gagarin's flight, many congressmen pledged their support for a crash program aimed at ensuring that America would catch up. Kennedy was circumspect in his response to the news, refusing to make a commitment on America's response to the Soviets. On April 20, Kennedy sent a memo to Vice President Lyndon B. Johnson, asking Johnson to look into the status of America's space program, and into programs that could offer NASA the opportunity to catch up. Johnson responded approximately one week later, concluding that "we are neither making maximum effort nor achieving results necessary if this country is to reach a position of leadership." His memo concluded that a manned Moon landing was far enough in the future that it was likely the United States would achieve it first. At the time of Kennedy's proposal, only one American had flown in space—less than a month earlier—and NASA had not yet sent an astronaut into orbit. Even some NASA employees doubted whether Kennedy's ambitious goal could be met. By 1963, Kennedy even came close to agreeing to a joint US-USSR Moon mission, to eliminate duplication of effort. With the clear goal of a manned landing replacing the more nebulous goals of space stations and circumlunar flights, NASA decided that, in order to make progress quickly, it would discard the feasibility study designs of Convair, GE, and Martin, and proceed with Faget's command and service module design. The mission module was determined to be only useful as an extra room, and therefore deemed unnecessary. They used Faget's design as the specification for another competition for spacecraft procurement bids in October 1961. On November 28, 1961, it was announced that North American Aviation had won the contract, although its bid was not rated as good as Martin's. Webb, Dryden and Robert Seamans chose it in preference due to North American's longer association with NASA and its predecessor. Landing men on the Moon by the end of 1969 required the most sudden burst of technological creativity, and the largest commitment of resources ($25 billion; $112 billion in 2018 dollars) ever made by any nation in peacetime. At its peak, the Apollo program employed 400,000 people and required the support of over 20,000 industrial firms and universities. On July 1, 1960, NASA established the Marshall Space Flight Center (MSFC) in Huntsville, Alabama. MSFC designed the heavy lift-class Saturn launch vehicles, which would be required for Apollo. It became clear that managing the Apollo program would exceed the capabilities of Robert R. Gilruth's Space Task Group, which had been directing the nation's manned space program from NASA's Langley Research Center. So Gilruth was given authority to grow his organization into a new NASA center, the Manned Spacecraft Center (MSC). A site was chosen in Houston, Texas, on land donated by Rice University, and Administrator Webb announced the conversion on September 19, 1961. It was also clear NASA would soon outgrow its practice of controlling missions from its Cape Canaveral Air Force Station launch facilities in Florida, so a new Mission Control Center would be included in the MSC. The MSC was completed in September 1963. It was renamed by the US Congress in honor of Lyndon Johnson soon after his death in 1973. It also became clear that Apollo would outgrow the Canaveral launch facilities in Florida. The two newest launch complexes were already being built for the Saturn I and IB rockets at the northernmost end: LC-34 and LC-37. But an even bigger facility would be needed for the mammoth rocket required for the manned lunar mission, so land acquisition was started in July 1961 for a Launch Operations Center (LOC) immediately north of Canaveral at Merritt Island. The design, development and construction of the center was conducted by Kurt H. Debus, a member of Dr. Wernher von Braun's original V-2 rocket engineering team. Debus was named the LOC's first Director. Construction began in November 1962. Upon Kennedy's death, President Johnson issued an executive order on November 29, 1963, to rename the LOC and Cape Canaveral in honor of Kennedy. The LOC included Launch Complex 39, a Launch Control Center, and a 130 million cubic foot (3.7 million cubic meter) Vertical Assembly Building (VAB) in which the space vehicle (launch vehicle and spacecraft) would be assembled on a Mobile Launcher Platform and then moved by a transporter to one of several launch pads. Although at least three pads were planned, only two, designated A and B, were completed in October 1965. The LOC also included an Operations and Checkout Building (OCB) to which Gemini and Apollo spacecraft were initially received prior to being mated to their launch vehicles. The Apollo spacecraft could be tested in two vacuum chambers capable of simulating atmospheric pressure at altitudes up to 250,000 feet (76 km), which is nearly a vacuum. Administrator Webb realized that in order to keep Apollo costs under control, he had to develop greater project management skills in his organization, so he recruited Dr. George E. Mueller for a high management job. Mueller accepted, on the condition that he have a say in NASA reorganization necessary to effectively administer Apollo. Webb then worked with Associate Administrator (later Deputy Administrator) Seamans to reorganize the Office of Manned Space Flight (OMSF). On July 23, 1963, Webb announced Mueller's appointment as Deputy Associate Administrator for Manned Space Flight, to replace then Associate Administrator D. Brainerd Holmes on his retirement effective September 1. Under Webb's reorganization, the directors of the Manned Spacecraft Center (Gilruth), Marshall Space Flight Center (von Braun), and the Launch Operations Center (Debus) reported to Mueller. Based on his industry experience on Air Force missile projects, Mueller realized some skilled managers could be found among high-ranking officers in the United States Air Force, so he got Webb's permission to recruit General Samuel C. Phillips, who gained a reputation for his effective management of the Minuteman program, as OMSF program controller. Phillips' superior officer Bernard A. Schriever agreed to loan Phillips to NASA, along with a staff of officers under him, on the condition that Phillips be made Apollo Program Director. Mueller agreed, and Phillips managed Apollo from January 1964, until it achieved the first manned landing in July 1969, after which he returned to Air Force duty. Lunar Orbit Rendezvous (LOR): This turned out to be the winning configuration, which achieved the goal with Apollo 11 on July 24, 1969: a single Saturn V launched a 96,886-pound (43,947 kg) spacecraft that was composed of a 63,608-pound (28,852 kg) Apollo command and service module which remained in orbit around the Moon, while a 33,278-pound (15,095 kg), two-stage lunar module was flown by two astronauts to the surface, flown back to dock with the command module, and then was discarded. Landing the smaller spacecraft on the Moon, and returning an even smaller part (10,042 pounds (4,555 kg)) to lunar orbit, minimized the total mass to be launched from Earth, but this was the last method initially considered because of the perceived risk of rendezvous and docking. 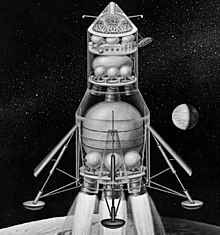 Direct Ascent: The spacecraft would be launched as a unit and travel directly to the lunar surface, without first going into lunar orbit. A 50,000-pound (23,000 kg) Earth return ship would land all three astronauts atop a 113,000-pound (51,000 kg) descent propulsion stage, which would be left on the Moon. This design would have required development of the extremely powerful Saturn C-8 or Nova launch vehicle to carry a 163,000-pound (74,000 kg) payload to the Moon. Earth Orbit Rendezvous (EOR): Multiple rocket launches (up to 15 in some plans) would carry parts of the Direct Ascent spacecraft and propulsion units for translunar injection (TLI). These would be assembled into a single spacecraft in Earth orbit. Lunar Surface Rendezvous: Two spacecraft would be launched in succession. The first, an automated vehicle carrying propellant for the return to Earth, would land on the Moon, to be followed some time later by the manned vehicle. Propellant would have to be transferred from the automated vehicle to the manned vehicle. In early 1961, direct ascent was generally the mission mode in favor at NASA. Many engineers feared that a rendezvous—let alone a docking—neither of which had been attempted even in Earth orbit, would be extremely difficult in lunar orbit. Dissenters including John Houbolt at Langley Research Center emphasized the important weight reductions that were offered by the LOR approach. Throughout 1960 and 1961, Houbolt campaigned for the recognition of LOR as a viable and practical option. Bypassing the NASA hierarchy, he sent a series of memos and reports on the issue to Associate Administrator Robert Seamans; while acknowledging that he spoke "somewhat as a voice in the wilderness," Houbolt pleaded that LOR should not be discounted in studies of the question. Seamans' establishment of an ad-hoc committee headed by his special technical assistant Nicholas E. Golovin in July 1961, to recommend a launch vehicle to be used in the Apollo program, represented a turning point in NASA's mission mode decision. This committee recognized that the chosen mode was an important part of the launch vehicle choice, and recommended in favor of a hybrid EOR-LOR mode. Its consideration of LOR—as well as Houbolt's ceaseless work—played an important role in publicizing the workability of the approach. In late 1961 and early 1962, members of the Manned Spacecraft Center began to come around to support LOR, including the newly hired deputy director of the Office of Manned Space Flight, Joseph Shea, who became a champion of LOR. The engineers at Marshall Space Flight Center (MSFC), which had much to lose from the decision, took longer to become convinced of its merits, but their conversion was announced by Wernher von Braun at a briefing on June 7, 1962. But even after NASA reached internal agreement, it was far from smooth sailing. Kennedy's science advisor Jerome Wiesner, who had expressed his opposition to manned spaceflight to Kennedy before the President took office, and had opposed the decision to land men on the Moon, hired Golovin, who had left NASA, to chair his own "Space Vehicle Panel", ostensibly to monitor, but actually to second-guess NASA's decisions on the Saturn V launch vehicle and LOR by forcing Shea, Seamans, and even Webb to defend themselves, delaying its formal announcement to the press on July 11, 1962, and forcing Webb to still hedge the decision as "tentative". Wiesner kept up the pressure, even making the disagreement public during a two-day September visit by the President to Marshall Space Flight Center. Wiesner blurted out "No, that's no good" in front of the press, during a presentation by von Braun. Webb jumped in and defended von Braun, until Kennedy ended the squabble by stating that the matter was "still subject to final review". Webb held firm, and issued a request for proposal to candidate Lunar Excursion Module (LEM) contractors. Wiesner finally relented, unwilling to settle the dispute once and for all in Kennedy's office, because of the President's involvement with the October Cuban Missile Crisis, and fear of Kennedy's support for Webb. NASA announced the selection of Grumman as the LEM contractor in November 1962. Without NASA's adoption of this stubbornly held minority opinion in 1962, the United States may still have reached the Moon, but almost certainly it would not have been accomplished by the end of the 1960s, President Kennedy's target date. The LOR method had the advantage of allowing the lander spacecraft to be used as a "lifeboat" in the event of a failure of the command ship. Some documents prove this theory was discussed before and after the method was chosen. In 1964 an MSC study concluded, "The LM [as lifeboat] ... was finally dropped, because no single reasonable CSM failure could be identified that would prohibit use of the SPS." Ironically, just such a failure happened on Apollo 13 when an oxygen tank explosion left the CSM without electrical power. The lunar module provided propulsion, electrical power and life support to get the crew home safely. 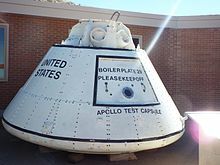 An Apollo boilerplate command module is on exhibit in the Meteor Crater Visitor Center in Winslow, Arizona. 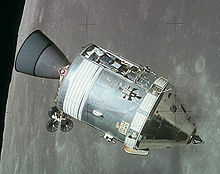 Faget's preliminary Apollo design employed a cone-shaped command module, supported by one of several service modules providing propulsion and electrical power, sized appropriately for the space station, cislunar, and lunar landing missions. Once Kennedy's Moon landing goal became official, detailed design began of a command and service Module (CSM) in which the crew would spend the entire direct-ascent mission and lift off from the lunar surface for the return trip, after being soft-landed by a larger landing propulsion module. The final choice of lunar orbit rendezvous changed the CSM's role to the translunar ferry used to transport the crew, along with a new spacecraft, the lunar excursion module (LEM, later shortened to lunar module, LM) which would take two men to the lunar surface and return them to the CSM. The command module (CM) was the conical crew cabin, designed to carry three astronauts from launch to lunar orbit and back to an Earth ocean landing. It was the only component of the Apollo spacecraft to survive without major configuration changes as the program evolved from the early Apollo study designs. Its exterior was covered with an ablative heat shield, and had its own reaction control system (RCS) engines to control its attitude and steer its atmospheric entry path. Parachutes were carried to slow its descent to splashdown. The module was 11.42 feet (3.48 m) tall, 12.83 feet (3.91 m) in diameter, and weighed approximately 12,250 pounds (5,560 kg). A cylindrical service module (SM) supported the command module, with a service propulsion engine and an RCS with propellants, and a fuel cell power generation system with liquid hydrogen and liquid oxygen reactants. A high-gain S-band antenna was used for long-distance communications on the lunar flights. On the extended lunar missions, an orbital scientific instrument package was carried. The service module was discarded just before reentry. The module was 24.6 feet (7.5 m) long and 12.83 feet (3.91 m) in diameter. The initial lunar flight version weighed approximately 51,300 pounds (23,300 kg) fully fueled, while a later version designed to carry a lunar orbit scientific instrument package weighed just over 54,000 pounds (24,000 kg). North American Aviation won the contract to build the CSM, and also the second stage of the Saturn V launch vehicle for NASA. Because the CSM design was started early before the selection of lunar orbit rendezvous, the service propulsion engine was sized to lift the CSM off the Moon, and thus was oversized to about twice the thrust required for translunar flight. Also, there was no provision for docking with the lunar module. A 1964 program definition study concluded that the initial design should be continued as Block I which would be used for early testing, while Block II, the actual lunar spacecraft, would incorporate the docking equipment and take advantage of the lessons learned in Block I development. The Apollo Lunar Module (LM) was designed to descend from lunar orbit to land two astronauts on the Moon and take them back to orbit to rendezvous with the command module. Not designed to fly through the Earth's atmosphere or return to Earth, its fuselage was designed totally without aerodynamic considerations, and was of an extremely lightweight construction. It consisted of separate descent and ascent stages, each with its own engine. The descent stage contained storage for the descent propellant, surface stay consumables, and surface exploration equipment. The ascent stage contained the crew cabin, ascent propellant, and a reaction control system. The initial LM model weighed approximately 33,300 pounds (15,100 kg), and allowed surface stays up to around 34 hours. An extended lunar module weighed over 36,200 pounds (16,400 kg), and allowed surface stays of over 3 days. The contract for design and construction of the lunar module was awarded to Grumman Aircraft Engineering Corporation, and the project was overseen by Thomas J. Kelly. Before the Apollo program began, Wernher von Braun and his team of rocket engineers had started work on plans for very large launch vehicles, the Saturn series, and the even larger Nova series. In the midst of these plans, von Braun was transferred from the Army to NASA, and made Director of the Marshall Space Flight Center. The initial direct ascent plan to send the three-man Apollo command and service module directly to the lunar surface, on top of a large descent rocket stage, would require a Nova-class launcher, with a lunar payload capability of over 180,000 pounds (82,000 kg). The June 11, 1962, decision to use lunar orbit rendezvous enabled the Saturn V to replace the Nova, and the MSFC proceeded to develop the Saturn rocket family for Apollo. Since Apollo, like Mercury, would require a launch escape system (LES) in case of a launch failure, a relatively small rocket was required for qualification flight testing of this system. A size bigger than the NAA Little Joe would be required, so the Little Joe II was built by General Dynamics/Convair. After an August 1963 qualification test flight, four LES test flights (A-001 through 004) were made at the White Sands Missile Range between May 1964 and January 1966. 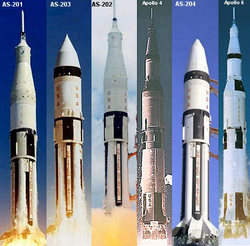 Since Apollo, like Mercury, used more than one launch vehicle for space missions, NASA used spacecraft-launch vehicle combination series numbers: AS-10x for Saturn I, AS-20x for Saturn IB, and AS-50x for Saturn V (compare Mercury-Redstone 3, Mercury-Atlas 6) to designate and plan all missions, rather than numbering them sequentially as in Project Gemini. This was changed by the time manned flights began. Saturn I, the first US heavy lift launch vehicle, was initially planned to launch partially equipped CSMs in low Earth orbit tests. The S-I first stage burned RP-1 with liquid oxygen (LOX) oxidizer in eight clustered Rocketdyne H-1 engines, to produce 1,500,000 pounds-force (6,670 kN) of thrust. The S-IV second stage used six liquid hydrogen-fueled Pratt & Whitney RL-10 engines with 90,000 pounds-force (400 kN) of thrust. A planned Centaur (S-V) third stage with two RL-10 engines never flew on Saturn I. The first four Saturn I test flights were launched from LC-34, with only live first stages, carrying dummy upper stages filled with water. The first flight with a live S-IV was launched from LC-37. This was followed by five launches of boilerplate CSMs (designated AS-101 through AS-105) into orbit in 1964 and 1965. The last three of these further supported the Apollo program by also carrying Pegasus satellites, which verified the safety of the translunar environment by measuring the frequency and severity of micrometeorite impacts. In September 1962, NASA planned to launch four manned CSM flights on the Saturn I from late 1965 through 1966, concurrent with Project Gemini. The 22,500-pound (10,200 kg) payload capacity would have severely limited the systems which could be included, so the decision was made in October 1963 to use the uprated Saturn IB for all manned Earth orbital flights. The Saturn IB was an upgraded version of the Saturn I. The S-IB first stage increased the thrust to 1,600,000 pounds-force (7,120 kN) by uprating the H-1 engine. The second stage replaced the S-IV with the S-IVB-200, powered by a single J-2 engine burning liquid hydrogen fuel with LOX, to produce 200,000 pounds-force (890 kN) of thrust. A restartable version of the S-IVB was used as the third stage of the Saturn V. The Saturn IB could send over 40,000 pounds (18,100 kg) into low Earth orbit, sufficient for a partially fueled CSM or the LM. Saturn IB launch vehicles and flights were designated with an AS-200 series number, "AS" indicating "Apollo Saturn" and the "2" indicating the second member of the Saturn rocket family. Saturn V launch vehicles and flights were designated with an AS-500 series number, "AS" indicating "Apollo Saturn" and the "5" indicating Saturn V. The three-stage Saturn V was designed to send a fully fueled CSM and LM to the Moon. It was 33 feet (10.1 m) in diameter and stood 363 feet (110.6 m) tall with its 96,800-pound (43,900 kg) lunar payload. Its capability grew to 103,600 pounds (47,000 kg) for the later advanced lunar landings. The S-IC first stage burned RP-1/LOX for a rated thrust of 7,500,000 pounds-force (33,400 kN), which was upgraded to 7,610,000 pounds-force (33,900 kN). The second and third stages burned liquid hydrogen, and the third stage was a modified version of the S-IVB, with thrust increased to 230,000 pounds-force (1,020 kN) and capability to restart the engine for translunar injection after reaching a parking orbit. NASA's director of flight crew operations during the Apollo program was Donald K. "Deke" Slayton, one of the original Mercury Seven astronauts who was medically grounded in September 1962 due to a heart murmur. Slayton was responsible for making all Gemini and Apollo crew assignments. Thirty-two astronauts were assigned to fly missions in the Apollo program. Twenty-four of these left Earth's orbit and flew around the Moon between December 1968 and December 1972 (three of them twice). Half of the 24 walked on the Moon's surface, though none of them returned to it after landing once. One of the moonwalkers was a trained geologist. Of the 32, Gus Grissom, Ed White, and Roger Chaffee were killed during a ground test in preparation for the Apollo 1 mission. The Apollo astronauts were chosen from the Project Mercury and Gemini veterans, plus from two later astronaut groups. All missions were commanded by Gemini or Mercury veterans. Crews on all development flights (except the Earth orbit CSM development flights) through the first two landings on Apollo 11 and Apollo 12, included at least two (sometimes three) Gemini veterans. Dr. Harrison Schmitt, a geologist, was the first NASA scientist astronaut to fly in space, and landed on the Moon on the last mission, Apollo 17. Schmitt participated in the lunar geology training of all of the Apollo landing crews. NASA awarded all 32 of these astronauts its highest honor, the Distinguished Service Medal, given for "distinguished service, ability, or courage", and personal "contribution representing substantial progress to the NASA mission". The medals were awarded posthumously to Grissom, White, and Chaffee in 1969, then to the crews of all missions from Apollo 8 onward. The crew that flew the first Earth orbital test mission Apollo 7, Walter M. Schirra, Donn Eisele, and Walter Cunningham, were awarded the lesser NASA Exceptional Service Medal, because of discipline problems with the flight director's orders during their flight. The NASA Administrator in October, 2008, decided to award them the Distinguished Service Medals, by this time posthumously to Schirra and Eisele. Launch The 3 Saturn V stages burn for about 11 minutes to achieve a 100-nautical-mile (190 km) circular parking orbit. The third stage burns a small portion of its fuel to achieve orbit. Lunar orbit insertion The spacecraft passes about 60 nautical miles (110 km) behind the Moon, and the SM engine is fired to slow the spacecraft and put it into a 60-by-170-nautical-mile (110 by 310 km) orbit, which is soon circularized at 60 nautical miles by a second burn. After a rest period, the commander (CDR) and lunar module pilot (LMP) move to the LM, power up its systems, and deploy the landing gear. The CSM and LM separate; the CMP visually inspects the LM, then the LM crew move a safe distance away and fire the descent engine for Descent orbit insertion, which takes it to a perilune of about 50,000 feet (15 km). Starting with Apollo 13, descent orbit insertion was to be performed using the service module engine instead of the LM engine, in order to allow a greater fuel reserve for landing. This was actually done for the first time on Apollo 14, since the Apollo 13 mission was aborted before landing. 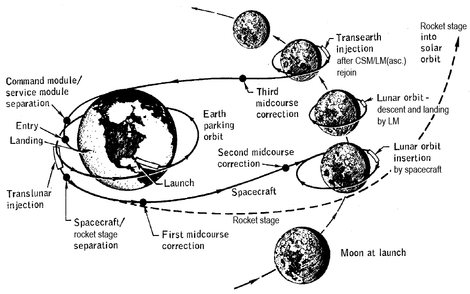 The first three lunar missions (Apollo 8, Apollo 10, and Apollo 11) used a free return trajectory, keeping a flight path coplanar with the lunar orbit, which would allow a return to Earth in case the SM engine failed to make lunar orbit insertion. Landing site lighting conditions on later missions dictated a lunar orbital plane change, which required a course change maneuver soon after TLI, and eliminated the free-return option. After Apollo 12 placed the second of several seismometers on the Moon, the S-IVBs on subsequent missions were deliberately crashed on the Moon instead of being sent to solar orbit, as an active seismic experiment to induce vibrations in the Moon. As another active seismic experiment, the jettisoned LM ascent stages on Apollo 12 and later missions were deliberately crashed on the Moon at known locations. The only exceptions to this were the Apollo 13 LM which burned up in the Earth's atmosphere, and Apollo 16, where a loss of attitude control after jettison prevented making a targeted impact. Two Block I CSMs were launched from LC-34 on suborbital flights in 1966 with the Saturn IB. The first, AS-201 launched on February 26, reached an altitude of 265.7 nautical miles (492.1 km) and splashed down 4,577 nautical miles (8,477 km) downrange in the Atlantic Ocean. The second, AS-202 on August 25, reached 617.1 nautical miles (1,142.9 km) altitude and was recovered 13,900 nautical miles (25,700 km) downrange in the Pacific Ocean. These flights validated the service module engine and the command module heat shield. A third Saturn IB test, AS-203 launched from pad 37, went into orbit to support design of the S-IVB upper stage restart capability needed for the Saturn V. It carried a nosecone instead of the Apollo spacecraft, and its payload was the unburned liquid hydrogen fuel, the behavior of which engineers measured with temperature and pressure sensors, and a TV camera. This flight occurred on July 5, before AS-202, which was delayed because of problems getting the Apollo spacecraft ready for flight. Two manned orbital Block I CSM missions were planned: AS-204 and AS-205. The Block I crew positions were titled Command Pilot, Senior Pilot, and Pilot. The Senior Pilot would assume navigation duties, while the Pilot would function as a systems engineer. The astronauts would wear a modified version of the Gemini spacesuit. After an unmanned LM test flight AS-206, a crew would fly the first Block II CSM and LM in a dual mission known as AS-207/208, or AS-278 (each spacecraft would be launched on a separate Saturn IB). The Block II crew positions were titled Commander, Command Module Pilot, and Lunar Module Pilot. The astronauts would begin wearing a new Apollo A6L spacesuit, designed to accommodate lunar extravehicular activity (EVA). The traditional visor helmet was replaced with a clear "fishbowl" type for greater visibility, and the lunar surface EVA suit would include a water-cooled undergarment. Deke Slayton, the grounded Mercury astronaut who became director of flight crew operations for the Gemini and Apollo programs, selected the first Apollo crew in January 1966, with Grissom as Command Pilot, White as Senior Pilot, and rookie Donn F. Eisele as Pilot. But Eisele dislocated his shoulder twice aboard the KC135 weightlessness training aircraft, and had to undergo surgery on January 27. Slayton replaced him with Chaffee. NASA announced the final crew selection for AS-204 on March 21, 1966, with the backup crew consisting of Gemini veterans James McDivitt and David Scott, with rookie Russell L. "Rusty" Schweickart. Mercury/Gemini veteran Wally Schirra, Eisele, and rookie Walter Cunningham were announced on September 29 as the prime crew for AS-205. In December 1966, the AS-205 mission was canceled, since the validation of the CSM would be accomplished on the 14-day first flight, and AS-205 would have been devoted to space experiments and contribute no new engineering knowledge about the spacecraft. Its Saturn IB was allocated to the dual mission, now redesignated AS-205/208 or AS-258, planned for August 1967. McDivitt, Scott and Schweickart were promoted to the prime AS-258 crew, and Schirra, Eisele and Cunningham were reassigned as the Apollo 1 backup crew. The spacecraft for the AS-202 and AS-204 missions were delivered by North American Aviation to the Kennedy Space Center with long lists of equipment problems which had to be corrected before flight; these delays caused the launch of AS-202 to slip behind AS-203, and eliminated hopes the first manned mission might be ready to launch as soon as November 1966, concurrently with the last Gemini mission. Eventually the planned AS-204 flight date was pushed to February 21, 1967. The problems with North American were severe enough in late 1965 to cause Manned Space Flight Administrator George Mueller to appoint program director Samuel Phillips to head a "tiger team" to investigate North American's problems and identify corrections. Phillips documented his findings in a December 19 letter to NAA president Lee Atwood, with a strongly worded letter by Mueller, and also gave a presentation of the results to Mueller and Deputy Administrator Robert Seamans. Meanwhile, Grumman was also encountering problems with the Lunar Module, eliminating hopes it would be ready for manned flight in 1967, not long after the first manned CSM flights. Grissom, White, and Chaffee decided to name their flight Apollo 1 as a motivational focus on the first manned flight. They trained and conducted tests of their spacecraft at North American, and in the altitude chamber at the Kennedy Space Center. A "plugs-out" test was planned for January, which would simulate a launch countdown on LC-34 with the spacecraft transferring from pad-supplied to internal power. If successful, this would be followed by a more rigorous countdown simulation test closer to the February 21 launch, with both spacecraft and launch vehicle fueled. The plugs-out test began on the morning of January 27, 1967, and immediately was plagued with problems. First the crew noticed a strange odor in their spacesuits, which delayed the sealing of the hatch. Then, communications problems frustrated the astronauts and forced a hold in the simulated countdown. During this hold, an electrical fire began in the cabin, and spread quickly in the high pressure, 100% oxygen atmosphere. Pressure rose high enough from the fire that the cabin inner wall burst, allowing the fire to erupt onto the pad area and frustrating attempts to rescue the crew. The astronauts were asphyxiated before the hatch could be opened. NASA immediately convened an accident review board, overseen by both houses of Congress. While the determination of responsibility for the accident was complex, the review board concluded that "deficiencies existed in command module design, workmanship and quality control." At the insistence of NASA Administrator Webb, North American removed Harrison Storms as command module program manager. Webb also reassigned Apollo Spacecraft Program Office (ASPO) Manager Joseph Francis Shea, replacing him with George Low. To remedy the causes of the fire, changes were made in the Block II spacecraft and operational procedures, the most important of which were use of a nitrogen/oxygen mixture instead of pure oxygen before and during launch, and removal of flammable cabin and space suit materials. The Block II design already called for replacement of the Block I plug-type hatch cover with a quick-release, outward opening door. NASA discontinued the manned Block I program, using the Block I spacecraft only for unmanned Saturn V flights. 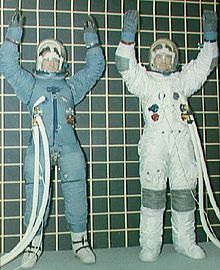 Crew members would also exclusively wear modified, fire-resistant A7L Block II space suits, and would be designated by the Block II titles, regardless of whether a LM was present on the flight or not. On April 24, 1967, Mueller published an official Apollo mission numbering scheme, using sequential numbers for all flights, manned or unmanned. The sequence would start with Apollo 4 to cover the first three unmanned flights while retiring the Apollo 1 designation to honor the crew, per their widows' wishes. In September 1967, Mueller approved a sequence of mission types which had to be successfully accomplished in order to achieve the manned lunar landing. Each step had to be successfully accomplished before the next ones could be performed, and it was unknown how many tries of each mission would be necessary; therefore letters were used instead of numbers. The A missions were unmanned Saturn V validation; B was unmanned LM validation using the Saturn IB; C was manned CSM Earth orbit validation using the Saturn IB; D was the first manned CSM/LM flight (this replaced AS-258, using a single Saturn V launch); E would be a higher Earth orbit CSM/LM flight; F would be the first lunar mission, testing the LM in lunar orbit but without landing (a "dress rehearsal"); and G would be the first manned landing. The list of types covered follow-on lunar exploration to include H lunar landings, I for lunar orbital survey missions, and J for extended-stay lunar landings. The delay in the CSM caused by the fire enabled NASA to catch up on man-rating the LM and Saturn V. Apollo 4 (AS-501) was the first unmanned flight of the Saturn V, carrying a Block I CSM on November 9, 1967. The capability of the command module's heat shield to survive a trans-lunar reentry was demonstrated by using the service module engine to ram it into the atmosphere at higher than the usual Earth-orbital reentry speed. Apollo 5 (AS-204) was the first unmanned test flight of LM in Earth orbit, launched from pad 37 on January 22, 1968, by the Saturn IB that would have been used for Apollo 1. The LM engines were successfully test-fired and restarted, despite a computer programming error which cut short the first descent stage firing. The ascent engine was fired in abort mode, known as a "fire-in-the-hole" test, where it was lit simultaneously with jettison of the descent stage. Although Grumman wanted a second unmanned test, George Low decided the next LM flight would be manned. This was followed on April 4, 1968, by Apollo 6 (AS-502) which carried a CSM and a LM Test Article as ballast. The intent of this mission was to achieve trans-lunar injection, followed closely by a simulated direct-return abort, using the service module engine to achieve another high-speed reentry. 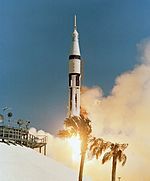 The Saturn V experienced pogo oscillation, a problem caused by non-steady engine combustion, which damaged fuel lines in the second and third stages. Two S-II engines shut down prematurely, but the remaining engines were able to compensate. The damage to the third stage engine was more severe, preventing it from restarting for trans-lunar injection. Mission controllers were able to use the service module engine to essentially repeat the flight profile of Apollo 4. Based on the good performance of Apollo 6 and identification of satisfactory fixes to the Apollo 6 problems, NASA declared the Saturn V ready to fly men, cancelling a third unmanned test. Apollo 7, launched from LC-34 on October 11, 1968, was the C mission, crewed by Schirra, Eisele and Cunningham. It was an 11-day Earth-orbital flight which tested the CSM systems. Apollo 8 was planned to be the D mission in December 1968, crewed by McDivitt, Scott and Schweickart, launched on a Saturn V instead of two Saturn IBs. In the summer it had become clear that the LM would not be ready in time. Rather than waste the Saturn V on another simple Earth-orbiting mission, ASPO Manager George Low suggested the bold step of sending Apollo 8 to orbit the Moon instead, deferring the D mission to the next mission in March 1969, and eliminating the E mission. This would keep the program on track. The Soviet Union had sent two tortoises, mealworms, wine flies, and other lifeforms around the Moon on September 15, 1968, aboard Zond 5, and it was believed they might soon repeat the feat with human cosmonauts. The decision was not announced publicly until successful completion of Apollo 7. Gemini veterans Frank Borman and Jim Lovell, and rookie William Anders captured the world's attention by making ten lunar orbits in 20 hours, transmitting television pictures of the lunar surface on Christmas Eve, and returning safely to Earth. The following March, LM flight, rendezvous and docking were successfully demonstrated in Earth orbit on Apollo 9, and Schweickart tested the full lunar EVA suit with its portable life support system (PLSS) outside the LM. The F mission was successfully carried out on Apollo 10 in May 1969 by Gemini veterans Thomas P. Stafford, John Young and Eugene Cernan. Stafford and Cernan took the LM to within 50,000 feet (15 km) of the lunar surface. The G mission was achieved on Apollo 11 in July 1969 by an all-Gemini veteran crew consisting of Neil Armstrong, Michael Collins and Buzz Aldrin. Armstrong and Aldrin performed the first landing at the Sea of Tranquility at 20:17:40 UTC on July 20, 1969. They spent a total of 21 hours, 36 minutes on the surface, and spent 2 hours, 31 minutes outside the spacecraft, walking on the surface, taking photographs, collecting material samples, and deploying automated scientific instruments, while continuously sending black-and-white television back to Earth. The astronauts returned safely on July 24. In November 1969, Gemini veteran Charles "Pete" Conrad and rookie Alan L. Bean made a precision landing on Apollo 12 within walking distance of the Surveyor 3 unmanned lunar probe, which had landed in April 1967 on the Ocean of Storms. The command module pilot was Gemini veteran Richard F. Gordon Jr. Conrad and Bean carried the first lunar surface color television camera, but it was damaged when accidentally pointed into the Sun. They made two EVAs totaling 7 hours and 45 minutes. On one, they walked to the Surveyor, photographed it, and removed some parts which they returned to Earth. The success of the first two landings allowed the remaining missions to be crewed with a single veteran as commander, with two rookies. Apollo 13 launched Lovell, Jack Swigert, and Fred Haise in April 1970, headed for the Fra Mauro formation. But two days out, a liquid oxygen tank exploded, disabling the service module and forcing the crew to use the LM as a "life boat" to return to Earth. Another NASA review board was convened to determine the cause, which turned out to be a combination of damage of the tank in the factory, and a subcontractor not making a tank component according to updated design specifications. Apollo was grounded again, for the remainder of 1970 while the oxygen tank was redesigned and an extra one was added. The contracted batch of 15 Saturn Vs were enough for lunar landing missions through Apollo 20. 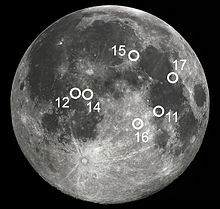 NASA publicized a preliminary list of eight more planned landing sites, with plans to increase the mass of the CSM and LM for the last five missions, along with the payload capacity of the Saturn V. These final missions would combine the I and J types in the 1967 list, allowing the CMP to operate a package of lunar orbital sensors and cameras while his companions were on the surface, and allowing them to stay on the Moon for over three days. These missions would also carry the Lunar Roving Vehicle (LRV) increasing the exploration area and allowing televised liftoff of the LM. Also, the Block II spacesuit was revised for the extended missions to allow greater flexibility and visibility for driving the LRV. About the time of the first landing in 1969, it was decided to use an existing Saturn V to launch the Skylab orbital laboratory pre-built on the ground, replacing the original plan to construct it in orbit from several Saturn IB launches; this eliminated Apollo 20. NASA's yearly budget also began to shrink in light of the successful landing, and NASA also had to make funds available for the development of the upcoming Space Shuttle. By 1971, the decision was made to also cancel missions 18 and 19. The two unused Saturn Vs became museum exhibits at the John F. Kennedy Space Center on Merritt Island, Florida, George C. Marshall Space Center in Huntsville, Alabama, Michoud Assembly Facility in New Orleans, Louisiana, and Lyndon B. Johnson Space Center in Houston, Texas. The cutbacks forced mission planners to reassess the original planned landing sites in order to achieve the most effective geological sample and data collection from the remaining four missions. Apollo 15 had been planned to be the last of the H series missions, but since there would be only two subsequent missions left, it was changed to the first of three J missions. Apollo 13's Fra Mauro mission was reassigned to Apollo 14, commanded in February 1971 by Mercury veteran Alan Shepard, with Stuart Roosa and Edgar Mitchell. This time the mission was successful. Shepard and Mitchell spent 33 hours and 31 minutes on the surface, and completed two EVAs totalling 9 hours 24 minutes, which was a record for the longest EVA by a lunar crew at the time. In August 1971, just after conclusion of the Apollo 15 mission, President Richard Nixon proposed canceling the two remaining lunar landing missions, Apollo 16 and 17. Office of Management and Budget Deputy Director Caspar Weinberger was opposed to this, and persuaded Nixon to keep the remaining missions. Apollo 15 was launched on July 26, 1971, with David Scott, Alfred Worden and James Irwin. Scott and Irwin landed on July 30 near Hadley Rille, and spent just under two days, 19 hours on the surface. In over 18 hours of EVA, they collected about 77 kilograms (170 lb) of lunar material. Apollo 16 landed in the Descartes Highlands on April 20, 1972. 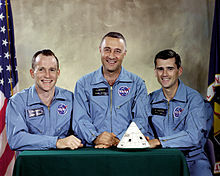 The crew was commanded by John Young, with Ken Mattingly and Charles Duke. Young and Duke spent just under three days on the surface, with a total of over 20 hours EVA. Apollo 17 was the last of the Apollo program, landing in the Taurus–Littrow region in December 1972. Eugene Cernan commanded Ronald E. Evans and NASA's first scientist-astronaut, geologist Dr. Harrison H. Schmitt. Schmitt was originally scheduled for Apollo 18, but the lunar geological community lobbied for his inclusion on the final lunar landing. Cernan and Schmitt stayed on the surface for just over three days and spent just over 23 hours of total EVA. AS-201 Feb 26, 1966 AS-201 CSM-009 None None First flight of Saturn IB and Block I CSM; suborbital to Atlantic Ocean; qualified heat shield to orbital reentry speed. AS-203 Jul 5, 1966 AS-203 None None None No spacecraft; observations of liquid hydrogen fuel behavior in orbit, to support design of S-IVB restart capability. AS-202 Aug 25, 1966 AS-202 CSM-011 None None Suborbital flight of CSM to Pacific Ocean. Roger B. Chaffee Not flown; all crew members perished in fire on launch pad on January 27, 1967. Apollo 4 Nov 9, 1967 AS-501 CSM-017 LTA-10R None First test flight of Saturn V, placed a CSM in a high Earth orbit; demonstrated S-IVB restart; qualified CM heat shield to lunar reentry speed. Apollo 5 Jan 22–23, 1968 AS-204 None LM-1 None Earth orbital flight test of LM, launched on Saturn IB; demonstrated ascent and descent propulsion; man-rated the LM. SM-014 LTA-2R None Unmanned, attempted demonstration of trans-lunar injection, and direct-return abort using SM engine; three engine failures, including failure of S-IVB restart. Flight controllers used SM engine to repeat Apollo 4's flight profile. Man-rated the Saturn V.
Donn Eisele First manned Earth orbital demonstration of Block II CSM, launched on Saturn IB. First live television publicly broadcast from a manned mission. 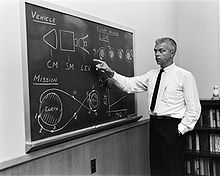 William Anders First manned flight to Moon; CSM made 10 lunar orbits in 20 hours. Russell Schweickart First manned flight of CSM and LM in Earth orbit; demonstrated portable life support system to be used on the lunar surface. Eugene Cernan Dress rehearsal for first lunar landing; flew LM down to 50,000 feet (15 km) from lunar surface. Buzz Aldrin First manned landing, in Tranquility Base, Sea of Tranquility. Surface EVA time: 2:31 hr. Samples returned: 47.51 pounds (21.55 kg). Alan Bean Second landing, in Ocean of Storms near Surveyor 3 . Surface EVA time: 7:45 hr. Samples returned: 75.62 pounds (34.30 kg). Fred Haise Third landing attempt aborted near the Moon, due to SM failure. Crew used LM as "life boat" to return to Earth. Edgar Mitchell Third landing, in Fra Mauro formation, located northeast of the Sea of Storms. Surface EVA time: 9:21 hr. Samples returned: 94.35 pounds (42.80 kg). James Irwin First Extended LM and rover, landed in Hadley-Apennine, located near the Sea of Showers/Rains. Surface EVA time:18:33 hr. Samples returned: 169.10 pounds (76.70 kg). Charles Duke Landed in Plain of Descartes. Surface EVA time: 20:14 hr. Samples returned: 207.89 pounds (94.30 kg). Harrison Schmitt Only Saturn V night launch. Landed in Taurus–Littrow. First geologist on the Moon. Apollo's last, and the most recent, manned Moon landing. Surface EVA time: 22:02 hr. Samples returned: 243.40 pounds (110.40 kg). The most famous of the Moon rocks recovered, the Genesis Rock, returned from Apollo 15. Ferroan Anorthosite Moon rock, returned from Apollo 16. The Apollo program returned over 382 kg (842 lb) of lunar rocks and soil to the Lunar Receiving Laboratory in Houston. Today, 75% of the samples are stored at the Lunar Sample Laboratory Facility built in 1979. The rocks collected from the Moon are extremely old compared to rocks found on Earth, as measured by radiometric dating techniques. They range in age from about 3.2 billion years for the basaltic samples derived from the lunar maria, to about 4.6 billion years for samples derived from the highlands crust. As such, they represent samples from a very early period in the development of the Solar System, that are largely absent on Earth. One important rock found during the Apollo Program is dubbed the Genesis Rock, retrieved by astronauts David Scott and James Irwin during the Apollo 15 mission. This anorthosite rock is composed almost exclusively of the calcium-rich feldspar mineral anorthite, and is believed to be representative of the highland crust. A geochemical component called KREEP was discovered by Apollo 12, which has no known terrestrial counterpart. KREEP and the anorthositic samples have been used to infer that the outer portion of the Moon was once completely molten (see lunar magma ocean). Almost all the rocks show evidence of impact process effects. Many samples appear to be pitted with micrometeoroid impact craters, which is never seen on Earth rocks, due to the thick atmosphere. Many show signs of being subjected to high pressure shock waves that are generated during impact events. Some of the returned samples are of impact melt (materials melted near an impact crater.) All samples returned from the Moon are highly brecciated as a result of being subjected to multiple impact events. Analysis of composition of the lunar samples supports the giant impact hypothesis, that the Moon was created through impact of a large astronomical body with the Earth. When President Kennedy first chartered the Moon landing program, a preliminary cost estimate of $7 billion was generated, but this proved an extremely unrealistic guess of what could not possibly be determined precisely, and James Webb used his judgment as administrator to change the estimate to $20 billion before giving it to Vice President Johnson. 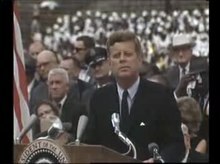 When Kennedy made his 1962 speech at Rice University, the annual space budget was $5.4 billion, and he described this cost as 40 cents per person per week, "somewhat less than we pay for cigarettes and cigars every year", but that the Moon program would soon raise this to "more than 50 cents a week for every man, woman and child in the United States". The final cost of Apollo was reported to Congress as $25.4 billion in 1973, It took up the majority of NASA's budget while it was being developed. For example, in 1966 it accounted for about 60 percent of NASA's total $5.2 billion budget. That was one of the biggest investment of the US in science, research and development, and employed thousands of American engineers, scientists and technicians. A single Saturn V launch in 1969 cost up to $375 million, compared to the National Science Foundation's fiscal year 1970 budget of $440 million. Looking beyond the manned lunar landings, NASA investigated several post-lunar applications for Apollo hardware. The Apollo Extension Series (Apollo X,) proposed up to 30 flights to Earth orbit, using the space in the Spacecraft Lunar Module Adapter (SLA) to house a small orbital laboratory (workshop). Astronauts would continue to use the CSM as a ferry to the station. This study was followed by design of a larger orbital workshop to be built in orbit from an empty S-IVB Saturn upper stage, and grew into the Apollo Applications Program (AAP). The workshop was to be supplemented by the Apollo Telescope Mount, which could be attached to the ascent stage of the lunar module via a rack. The most ambitious plan called for using an empty S-IVB as an interplanetary spacecraft for a Venus fly-by mission. The S-IVB orbital workshop was the only one of these plans to make it off the drawing board. Dubbed Skylab, it was constructed complete on the ground rather than in space, and launched in 1973 using the two lower stages of a Saturn V. It was equipped with an Apollo Telescope Mount. Skylab's last crew departed the station on February 8, 1974, and the station itself reentered the atmosphere in 1979. The Apollo-Soyuz Test Project also used Apollo hardware for the first joint nation space flight, paving the way for future cooperation with other nations in the Space Shuttle and International Space Station programs. In September 2007, the X Prize Foundation and Google announced the Google Lunar X Prize, to be awarded for a robotic lunar landing mission which transmits close-up images of the Apollo lunar modules and other artificial objects on the surface. In 2008, Japan Aerospace Exploration Agency's SELENE probe observed evidence of the halo surrounding the Apollo 15 Lunar Module blast crater while orbiting above the lunar surface. 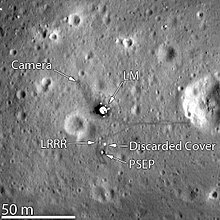 In 2009, NASA's robotic Lunar Reconnaissance Orbiter, while orbiting 50 kilometers (31 mi) above the Moon, began photographing the remnants of the Apollo program left on the lunar surface, and photographed each site where manned Apollo flights landed. All of the U. S. flags left on the Moon during the Apollo missions were found to still be standing, with the exception of the one left during the Apollo 11 mission, which was blown over during that mission's lift-off from the lunar surface and return to the mission Command Module in lunar orbit; the degree to which these flags retain their original colors remains unknown. 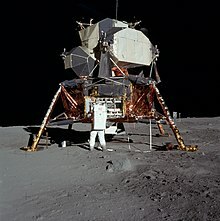 There the [Apollo 11] lunar module sits, parked just where it landed 40 years ago, as if it still really were 40 years ago and all the time since merely imaginary. The Apollo program has been called the greatest technological achievement in human history. Apollo stimulated many areas of technology, leading to over 1,800 spinoff products as of 2015. The flight computer design used in both the lunar and command modules was, along with the Polaris and Minuteman missile systems, the driving force behind early research into integrated circuits (IC). By 1963, Apollo was using 60 percent of the United States' production of ICs. The crucial difference between the requirements of Apollo and the missile programs was Apollo's much greater need for reliability. While the Navy and Air Force could work around reliability problems by deploying more missiles, the political and financial cost of failure of an Apollo mission was unacceptably high. 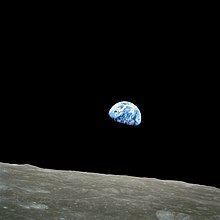 The crew of Apollo 8 sent the first live televised pictures of the Earth and the Moon back to Earth, and read from the creation story in the Book of Genesis, on Christmas Eve 1968. An estimated one quarter of the population of the world saw—either live or delayed—the Christmas Eve transmission during the ninth orbit of the Moon, and an estimated one fifth of the population of the world watched the live transmission of the Apollo 11 moonwalk. The Apollo program also affected environmental activism in the 1970s due to photos taken by the astronauts. 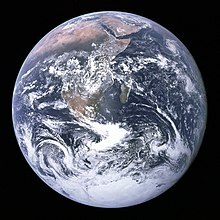 The most famous, taken by the Apollo 17 astronauts, is The Blue Marble. This image, which was released during a surge in environmentalism, became a symbol of the environmental movement, as a depiction of Earth's frailty, vulnerability, and isolation amid the vast expanse of space. According to The Economist, Apollo succeeded in accomplishing President Kennedy's goal of taking on the Soviet Union in the Space Race, and beat it by accomplishing a singular and significant achievement, to demonstrate the superiority of the free-market system. The publication noted the irony that in order to achieve the goal, the program required the organization of tremendous public resources within a vast, centralized government bureaucracy. 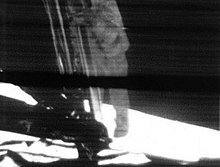 As part of Apollo 11's 40th anniversary in 2009, NASA spearheaded an effort to digitally restore the existing videotapes of the mission's live televised moonwalk. After an exhaustive three-year search for missing tapes of the original video of the Apollo 11 moonwalk, NASA concluded the data tapes had more than likely been accidentally erased. We're all saddened that they're not there. We all wish we had 20-20 hindsight. I don't think anyone in the NASA organization did anything wrong, I think it slipped through the cracks, and nobody's happy about it. 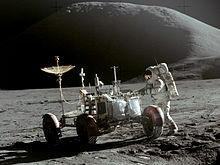 The lunar EVA video was produced with a special Apollo TV camera which scanned the picture in a format incompatible with broadcast TV. This required conversion for live television broadcast, which due to the state of 1969 technology caused some degradation of picture quality. But the unconverted picture signal was recorded on magnetic telemetry tapes. In 2006, Stanley Lebar, who had led the team that designed and built the lunar television camera at Westinghouse Electric Corporation, worked with Nafzger to try to locate the missing tapes, with the goal of seeing if more modern technology could produce a broadcast-ready picture closer to the original quality. However, in the intervening years, a magnetic tape shortage prompted NASA to recall massive numbers of magnetic tapes from the National Archives and Records Administration to be reused to record newer satellite data. So I don't believe that the tapes exist today at all. It was a hard thing to accept. But there was just an overwhelming amount of evidence that led us to believe that they just don't exist anymore. And you have to accept reality. With a budget of $230,000, the surviving original lunar broadcast data from Apollo 11 was compiled by Nafzger and assigned to Lowry Digital for restoration. The video was processed to remove random noise and camera shake without destroying historical legitimacy. The images were from tapes in Australia, the CBS News archive, and kinescope recordings made at Johnson Space Center. The restored video, remaining in black and white, contains conservative digital enhancements and did not include sound quality improvements. The Apollo program, or certain missions, have been dramatized in Apollo 13 (1995), Apollo 11 (1996), From the Earth to the Moon (1998), The Dish (2000), Space Race (2005), Moonshot (2009), and First Man (2018). ^ a b 93rd Congress 1973, p. 1271. ^ a b c d Thomas, Ryland; Williamson, Samuel H. (2019). "What Was the U.S. GDP Then?". MeasuringWorth. Retrieved April 6, 2019. United States Gross Domestic Product deflator figures follow the Measuring Worth series. ^ "Release 69-36" (Press release). Cleveland, OH: Lewis Research Center. July 14, 1969. Retrieved June 21, 2012. ^ Preble, Christopher A. (2003). ""Who Ever Believed in the 'Missile Gap'? ": John F. Kennedy and the Politics of National Security". Presidential Studies Quarterly. 33 (4): 813. JSTOR 27552538. ^ Launius, Roger D. (July 1994). "President John F. Kennedy Memo for Vice President, 20 April 1961" (PDF). Apollo: A Retrospective Analysis (PDF). Monographs in Aerospace History. Washington, D.C.: NASA. OCLC 31825096. Retrieved August 1, 2013. Key Apollo Source Documents. ^ Launius, Roger D. (July 1994). "Lyndon B. Johnson, Vice President, Memo for the President, 'Evaluation of Space Program,' 28 April 1961" (PDF). Apollo: A Retrospective Analysis (PDF). Monographs in Aerospace History. Washington, D.C.: NASA. OCLC 31825096. Retrieved August 1, 2013. Key Apollo Source Documents. ^ Kennedy, John F. (May 25, 1961). Special Message to Congress on Urgent National Needs (Motion picture (excerpt)). Boston, MA: John F. Kennedy Presidential Library and Museum. Accession Number: TNC:200; Digital Identifier: TNC-200-2. Retrieved August 1, 2013. ^ Sietzen, Frank (October 2, 1997). "Soviets Planned to Accept JFK's Joint Lunar Mission Offer". SpaceDaily. SpaceCast News Service. Retrieved August 1, 2013. ^ "Soyuz - Development of the Space Station; Apollo - Voyage to the Moon". Retrieved June 12, 2016. ^ Allen, Bob (ed.). "NASA Langley Research Center's Contributions to the Apollo Program". Langley Research Center. NASA. Retrieved August 1, 2013. ^ "Historical Facts". MSFC History Office. Archived from the original on June 3, 2016. Retrieved June 7, 2016. ^ Swenson, Loyd S., Jr.; Grimwood, James M.; Alexander, Charles C. (1989) [Originally published 1966]. "Chapter 12.3: Space Task Group Gets a New Home and Name". This New Ocean: A History of Project Mercury. The NASA History Series. Washington, D.C.: NASA. OCLC 569889. NASA SP-4201. Retrieved August 1, 2013. ^ a b Kennedy, John F. (September 12, 1962). "Address at Rice University on the Nation's Space Effort". Boston, MA: John F. Kennedy Presidential Library and Museum. Archived from the original on May 6, 2010. Retrieved August 1, 2013. ^ Nixon, Richard M. (February 19, 1973). "50 – Statement About Signing a Bill Designating the Manned Spacecraft Center in Houston, Texas, as the Lyndon B. Johnson Space Center". The American Presidency Project. University of California, Santa Barbara. Retrieved July 9, 2011. ^ "Dr. Kurt H. Debus". Kennedy Biographies. NASA. February 1987. Retrieved October 7, 2008. ^ "Executive Orders Disposition Tables: Lyndon B. Johnson - 1963: Executive Order 11129". Office of the Federal Register. National Archives and Records Administration. Retrieved April 26, 2010. ^ Craig, Kay (ed.). "KSC Technical Capabilities: O&C Altitude Chambers". Center Planning and Development Office. NASA. Archived from the original on March 28, 2012. Retrieved July 29, 2011. ^ "1976 Standard Atmosphere Properties". luizmonteiro.com (Complete International Standard Atmosphere calculator (1976 model)). Luizmonteiro, LLC. Retrieved August 1, 2013. ^ Narvaez, Alfonso A. (February 1, 1990). "Samuel C. Phillips, Who Directed Apollo Lunar Landing, Dies at 68". The New York Times. Retrieved April 14, 2010. ^ Orloff, Richard W. (September 2004). Apollo by the Numbers: A Statistical Reference. Launch Vehicle/Spacecraft Key Facts - 2nd table. Washington DC: NASA History Division. ISBN 016-050631-X. Retrieved August 8, 2018. ^ Using the Apollo 11 lunar lander's mass ratio of 22,667-pound (10,282 kg) descent stage to 10,042-pound (4,555 kg) ascent stage, scaled up to Nova's 163,000-pound (74,000 kg) payload. ^ Brooks, Grimwood, and Swenson (1979). Chariots For Apollo, chapter 2.6, "Influences on Booster Determination". NASA SP-4205. ^ Brooks, Grimwood, and Swenson (1979). Chariots For Apollo, chapter 3.7, "Casting the Die". NASA SP-4205. ^ Brooks, Grimwood, and Swenson (1979). Chariots For Apollo, chapter 4.4, "Pressures by PSAC". NASA SP-4205. ^ Letterman, p. 404 (James Lovell, "Explosion on Apollo 13; April 1970: From the Earth to the Moon and Back". Lovell writes, "Naturally, I'm glad that view didn't prevail, and I'm thankful that by the time of Apollo 10, the first lunar mission carrying the LM, the LM as a lifeboat was again being discussed."). ^ a b Dumoulin, Jim (June 29, 2001). "Apollo-13 (29)". Historical Archive for Manned Missions. NASA. Retrieved September 12, 2012. ^ a b "Apollo Program Summary Report" (PDF). Houston, TX: NASA. April 1975. pp. 3–66–4–12. JSC-09423. Retrieved August 1, 2013. ^ a b c Orloff 2004, "Launch Vehicle/Spacecraft Key Facts - 2nd Table"
^ Leary, Warren E. (March 27, 2002). "T. J. Kelly, 72, Dies; Father of Lunar Module". The New York Times. Retrieved August 1, 2013. ^ a b c "Apollo 11 30th Anniversary: Manned Apollo Missions". NASA History Office. 1999. Archived from the original on February 20, 2011. Retrieved March 3, 2011. ^ Dawson & Bowles 2004, p. 85. See footnote 61. ^ Brooks, et al. 1979, Chapter 7.6: "Portents for Operations"
^ Apollo Systems Description (PDF) (Technical Memorandum). Volume II: Saturn Launch Vehicles. NASA. February 1, 1964. p. 3-3. NASA TM-X-881. Retrieved August 1, 2013. ^ Wade, Mark. "Apollo SA-11". Encyclopedia Astronautica. Archived from the original on June 17, 2012. Retrieved June 21, 2012. ^ "Influences on Booster Determination". NASA HQ. Retrieved June 7, 2016. ^ "Saturn IB Design Features". Saturn IB News Reference (PDF). NASA; Chrysler Corporation; McDonnell Douglas Astronautics Company; International Business Machines Corporation; Rocketdyne. December 1965. OCLC 22102803. Retrieved August 1, 2013. ^ a b "Origin of NASA's Names: Manned Spaceflight". Retrieved July 19, 2016. ^ Orloff 2004 Launch "Vehicle/Spacecraft Key Facts - 1st Table"
^ "Astronaut Bio: Deke Slayton 6/93". NASA. June 1993. Retrieved August 1, 2013. ^ "Astronaut Bio: Harrison Schmitt". NASA. December 1994. Retrieved September 12, 2012. ^ Pearlman, Robert Z. (October 20, 2008). "First Apollo flight crew last to be honored". collectSPACE. Robert Pearlman. Retrieved June 12, 2014. ^ Gatland, Kenneth (1976). Manned Spacecraft. New York: MacMillan. pp. 75–85, 88–89. ^ McDivitt, James A. (April 1971). "7.0 Command and Service Module Performance". Apollo 14 Mission Report. Houston, Texas: NASA Manned Spacecraft Center. Retrieved May 19, 2016. ^ McDivitt, James A. (March 1970). Apollo 12 Mission Report (PDF). Houston, Texas: NASA Manned Spacecraft Center. p. 5-4. ^ "Apollo 12 Lunar Module / ALSEP". NASA Space Science Data Coordinate Archive. Retrieved June 15, 2016. ^ "Apollo 13's Booster Impact". NASA. Retrieved June 16, 2016. ^ Williams, David R. "Apollo: Where are they now?". National Space Science Data Center. NASA. Retrieved December 2, 2011. ^ Postlaunch Report for Mission AS-201 (Apollo Spacecraft 009) (PDF). Houston, TX: NASA. May 6, 1966. MSC-A-R-66-4. Retrieved August 1, 2013. ^ Postlaunch Report for Mission AS-202 (Apollo Spacecraft 011) (PDF). Houston, TX: NASA. October 12, 1966. MSC-A-R-66-5. Retrieved August 1, 2013. ^ Chrysler Corp. (January 13, 1967). Evaluation of AS-203 Low Gravity Orbital Experiment (Technical report). NASA. 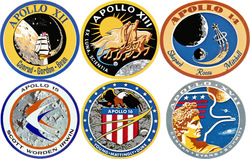 ^ "Apollo flight crew nomenclature changes". Astronautix. Archived from the original on February 1, 2010. Retrieved July 8, 2016. ^ "A1C". Astronautix. Retrieved July 8, 2016. ^ a b Lutz, Charles C.; Carson, Maurice A. (November 1975). "Apollo Experience Report - Development of the Extravehicular Mobility Unit" (PDF). NASA Technical Note. TN D-8093: 22–25. Retrieved May 18, 2016. ^ a b Teitel, Amy Shira (December 4, 2013) . "How Donn Eisele Became "Whatshisname," the Command Module Pilot of Apollo 7". Popular Science. ^ Brooks, et al. 1979, Chapter 8.7: "Preparations for the First Manned Apollo Mission"
^ Orloff 2004, "Apollo 1: The Fire 27 January 1967"
^ Benson, Charles D.; Faherty, William Barnaby (1978). "Delay after Delay after Delay". Moonport: A History of Apollo Launch Facilities and Operations. The NASA History Series. Washington, D.C.: Scientific and Technical Information Office, NASA. LCCN 77029118. OCLC 3608505. NASA SP-4204. Archived from the original on January 23, 2008. Retrieved August 1, 2013. ^ NASA never volunteered the tiger team findings to the US Congress in the course of its regular oversight, but its existence was publicly disclosed as "the Phillips report" in the course of the Senate investigation into the Apollo 204 fire. "The Phillips Report". NASA History Office. Archived from the original on April 15, 2010. Retrieved April 14, 2010. ^ Brooks, et al. 1979, Chapter 7.4: "The LEM Test Program: A Pacing Item"
^ Seamans, Robert C., Jr. (April 5, 1967). "Description of Test Sequence and Objectives". Report of Apollo 204 Review Board. NASA History Office. Retrieved October 7, 2007. ^ a b Seamans, Robert C., Jr. (April 5, 1967). "Findings, Determinations And Recommendations". Report of Apollo 204 Review Board. NASA History Office. Retrieved October 7, 2007. ^ a b Brooks, Courtney; Grimwood, James; Swenson, Loyd (1979). "The Slow Recovery". NASA. Retrieved May 14, 2016. ^ Low, George M. (1975). "Testing and Retesting To Get Ready For flight". In Cortright, Edgar M (ed.). Apollo Expeditions to the Moon. Washington, D.C.: Scientific and Technical Information Office, NASA. LCCN 75600071. OCLC 1623434. NASA SP-350. Retrieved August 1, 2013. ^ Brooks, et al. 1979, Chapter 10.5: "Apollo 6: Saturn V's Shaky Dress Rehearsal"
^ "Mission Objective". Retrieved July 8, 2016. ^ Chaikin, Andrew (1994). A Man on the Moon: The Voyages of the Apollo Astronauts. New York: Viking. ISBN 978-0-670-81446-6. LCCN 93048680. ^ "Poised for the Leap". Time. New York. December 6, 1968. Retrieved December 15, 2011. ^ "Apollo 9". NASA Space Science Data Coordinated Archive. Retrieved July 8, 2016. ^ "Apollo 10". NASA JSC. Retrieved July 8, 2016. ^ a b "Extravehicular Activity". Retrieved June 11, 2016. ^ "Apollo 11 Mission Overview". NASA. Retrieved July 8, 2016. ^ Mikkelson, Barbara; Mikkelson, David P. (October 2006). "One Small Misstep: Neil Armstrong's First Words on the Moon". Snopes.com. Urban Legends Reference Pages. Retrieved September 19, 2009. ^ Conrad, Charles, Jr.; Shepard, Alan B, Jr. (1975). "Tan Dust On Surveyor". In Cortright, Edgar M (ed.). Apollo Expeditions to the Moon. Washington, D.C.: Scientific and Technical Information Office, NASA. LCCN 75600071. OCLC 1623434. NASA SP-350. Retrieved August 1, 2013. ^ Wright, Mike. "Three Saturn Vs on Display Teach Lessons in Space History". Marshall Space Flight Center History Office. Retrieved July 19, 2016. ^ Williams, David (December 11, 2003). "Apollo 18 through 20 - The Cancelled Missions". NASA Space Science Data Coordinated Archive. Retrieved June 11, 2016. ^ a b "Apollo 14". NASA. July 8, 2009. Retrieved June 11, 2016. ^ "Apollo 14 Command and Service Module (CSM)". NASA Space Science Data Coordinated Archive. Retrieved June 11, 2016. ^ "Apollo 15". NASA. July 8, 2009. Retrieved June 9, 2016. ^ "Apollo 16". NASA. July 8, 2009. Retrieved June 9, 2016. ^ a b "Apollo 17". NASA. July 30, 2015. Retrieved June 9, 2016. ^ Grinter, Kay (September 28, 2011). "Apollo 18' Myths Debunked, NASA-style". NASA. Retrieved June 10, 2016. ^ Howell, Elizabeth (April 23, 2013). "Harrison Schmitt: Geologist on the Moon". Space.com. Retrieved June 10, 2016. ^ a b Orloff 2004, "Extravehicular Activity"
^ Chaikin, Andrew (2007). A Man On the Moon: The Voyages of the Apollo Astronauts (Third ed.). New York: Penguin Books. pp. 611–613. ^ Kristen Erickson (July 16, 2009). Amiko Kauderer (ed.). "Rock Solid: JSC's Lunar Sample Lab Turns 30". 40th Anniversary of Apollo Program. NASA. Retrieved June 29, 2012. ^ Harland 2008, pp. 132-133. ^ Harland 2008, p. 171. ^ Harland 2008, pp. 49-50. ^ Harland 2008, pp. 323-327. ^ Harland 2008, pp. 330-332. ^ a b Butts, Glenn; Linton, Kent (April 28, 2009). "The Joint Confidence Level Paradox: A History of Denial" (PDF). 2009 NASA Cost Symposium. Cost Analysis Division. pp. 25–26. Archived from the original (PDF) on October 26, 2011. ^ "Apollo Program Budget Appropriations". ^ Skolnikoff, Eugene B.; Hoagland, John H. (1968). The World-wide Spread of Space Technology. 69-5. Cambridge, MA: MIT Center for Space Research. OCLC 14154430. ^ "A Science Program for Manned Spaceflight". Retrieved June 11, 2016. ^ "Manned Venus Flyby". NASA. February 1, 1967. Retrieved July 19, 2016. ^ "What Goes Up..." Retrieved June 11, 2016. ^ "Apollo-Soyuz: An Orbital Partnership Begins". NASA. July 10, 2015. Retrieved July 19, 2016. ^ "Rules Overview". Google Lunar X Prize. X PRIZE Foundation. Retrieved August 1, 2013. ^ "The 'halo' area around Apollo 15 landing site observed by Terrain Camera on SELENE(KAGUYA)" (Press release). Chōfu, Tokyo: Japan Aerospace Exploration Agency. May 20, 2008. Archived from the original on December 12, 2009. Retrieved November 19, 2009. ^ Hautaluoma, Grey; Freeberg, Andy (July 17, 2009). Garner, Robert (ed.). "LRO Sees Apollo Landing Sites". NASA. Archived from the original on November 16, 2009. Retrieved November 19, 2009. ^ Townsend, Jason (ed.). "Apollo Landing Sites Revisited". NASA. Archived from the original on November 13, 2009. Retrieved November 19, 2009. ^ Robinson, Mark (July 27, 2012). "Question Answered!". LROC News System. Arizona State University. Archived from the original on October 24, 2012. Retrieved October 28, 2012. ^ "The Human Moon". The New York Times. November 16, 2009. Archived from the original on December 31, 2012. Retrieved November 19, 2009. ^ "Apollo 11 30th Anniversary: Introduction". NASA History Office. 1999. Retrieved April 26, 2013. ^ "The Moon Landing". BBC News. London: BBC. July 23, 1999. Archived from the original on October 2, 2002. Retrieved August 1, 2013. ^ NASA Spinoff Database (April 8, 2016). "NASA Spinoff Database". National Aeronautics and Space Administration. ^ Mindell 2008, pp. 125-131. ^ "Apollo 8: Christmas at the Moon". NASA. Retrieved July 20, 2016. ^ Petsko, Gregory A (2011). "The blue marble". Genome Biology. 12 (4): 112. doi:10.1186/gb-2011-12-4-112. PMC 3218853. PMID 21554751. ^ Lexington, ed. (May 21, 2011). "Apollo plus 50". The Economist. London: The Economist Newspaper Limited. p. 36. Retrieved August 1, 2013. ^ "Apollo 40th Anniversary". NASA. Archived from the original on June 9, 2012. Retrieved June 21, 2012. ^ a b c d Greenfieldboyce, Nell (July 16, 2009). "Houston, We Erased The Apollo 11 Tapes". NPR. Washington, D.C.: National Public Radio, Inc. Retrieved August 1, 2013. ^ a b Borenstein, Seth (July 17, 2009). "NASA lost moon footage, but Hollywood restores it". U.S. News & World Report. Associated Press. Retrieved August 1, 2013. Beschloss, Michael R. (1997). "Kennedy and the Decision to Go to the Moon". In Launius, Roger D.; McCurdy, Howard E. (eds.). Spaceflight and the Myth of Presidential Leadership. Champaign, IL: University of Illinois Press. ISBN 0-252-06632-4. LCCN 96051213. Bilstein, Roger E. (1996) [Originally published 1980]. Stages to Saturn: A Technological History of the Apollo/Saturn Launch Vehicles. The NASA History Series. Foreword by William R. Lucas. Washington D.C.: NASA. OCLC 36332191. NASA SP-4206. Retrieved August 1, 2013. Brooks, Courtney G.; Grimwood, James M.; Swenson, Loyd S., Jr. (1979). Chariots for Apollo: A History of Manned Lunar Spacecraft. The NASA History Series. Foreword by Samuel C. Phillips. Washington, D.C.: Scientific and Technical Information Branch, NASA. ISBN 978-0-486-46756-6. LCCN 79001042. OCLC 4664449. NASA SP-4205. Retrieved August 1, 2013. Burrows, William E. (1999). This New Ocean: The Story of the First Space Age. New York: Modern Library. ISBN 0-375-75485-7. OCLC 42136309. Chaikin, Andrew (1994). A Man on the Moon. New York: Penguin Books. ISBN 0-14-027201-1. OCLC 38918860. Chaikin interviewed all the surviving astronauts and others who worked with the program. Compton, William David (1989). Where no man has gone before : a history of Apollo lunar exploration missions. NASA history series. Washington, DC: National Aeronautics and Space Administration. OCLC 18223277. NASA SP-4214. Dawson, Virginia P.; Bowles, Mark D. (2004). Taming Liquid Hydrogen: The Centaur Upper Stage Rocket 1958-2002 (PDF). The NASA History Series. Washington D.C.: NASA. OCLC 51518552. NASA SP-2400-4320. Retrieved September 12, 2012. Ertel, Ivan D.; Newkirk, Roland W.; et al. (1978). The Apollo Spacecraft: A Chronology (PDF). IV. Foreword by Kenneth S. Kleinknecht. Washington, D.C.: Scientific and Technical Information Office, NASA. LCCN 69060008. OCLC 23818. NASA SP-4009. Retrieved August 1, 2013. Gray, Mike (1994) [First published W. W. Norton & Company 1992]. Angle of Attack: Harrison Storms and the Race to the Moon. New York: Penguin Books. ISBN 0-14-023280-X. OCLC 30520885. Hansen, James R. (1999). Enchanted Rendezvous: John C. Houbolt and the Genesis of the Lunar-Orbit Rendezvous Concept (PDF). Monographs in Aerospace History. Washington, D.C.: NASA. OCLC 69343822. Retrieved May 3, 2012. Harland, David M. (2008). Exploring the Moon: the Apollo Expeditions. Springer-Praxis books in space exploration. Chichester, England: Springer. ISBN 9780387746388. OCLC 495296214. Heppenheimer, T.A. (1999). The Space Shuttle Decision: NASA's Search for a Reusable Space Vehicle. The NASA History Series. Washington, D.C.: NASA. OCLC 40305626. NASA SP-4221. Retrieved August 1, 2013. Johnson, Stephen B. (2002). The Secret of Apollo: Systems Management in American and European Space Programs. New series in NASA history. Baltimore: Johns Hopkins University Press. ISBN 0-8018-6898-X. LCCN 2001005688. OCLC 48003131. Launius, Roger D.; McCurdy, Howard E., eds. (1997). Spaceflight and the Myth of Presidential Leadership. Champaign, IL: University of Illinois Press. ISBN 0-252-06632-4. LCCN 96051213. Launius, Roger D. (July 2004) [Originally published July 1994]. Apollo: A Retrospective Analysis. Monographs in Aerospace History (Reprint ed.). Washington, D.C.: NASA. Retrieved August 1, 2013. Letterman, John B. (2003). Survivors: True Tales of Endurance: 500 Years of the Greatest Eyewitness Accounts. New York: Simon & Schuster. ISBN 0-7432-4547-4. Mindell, David A. (2008). Digital Apollo: Human and Machine in Spaceflight. Cambridge, Massachusetts: The MIT Press. ISBN 978-0-262-13497-2. OCLC 733307011. Murray, Charles; Cox, Catherine Bly (1989). Apollo: The Race to the Moon. New York: Simon & Schuster. ISBN 0-671-61101-1. LCCN 89006333. OCLC 19589707. Orloff, Richard W. (September 2004) [First published 2000]. Apollo by the Numbers: A Statistical Reference. NASA History Division, Office of Policy and Plans. The NASA History Series. Washington, D.C.: NASA. ISBN 0-16-050631-X. LCCN 00061677. NASA SP-2000-4029. Retrieved August 1, 2013. Papike, James J.; Ryder, Graham; Shearer, Charles K. (January 1998). "Planetary Materials: Lunar Samples". Reviews in Mineralogy and Geochemistry. Washington, D.C.: Mineralogical Society of America. 36 (1): 5.1–5.234. ISBN 0-939950-46-4. ISSN 0275-0279. LCCN 99474392. Sidey, Hugh (1963). John F. Kennedy, President (1st ed.). New York: Atheneum. LCCN 63007800. Retrieved August 1, 2013. Wilford, John Noble (1969). We Reach the Moon: The New York Times Story of Man's Greatest Adventure. New York: Bantam Paperbacks. OCLC 29123. Collins, Michael (2001) [Originally published 1974; New York: Farrar, Straus and Giroux]. Carrying the Fire: An Astronaut's Journeys. Foreword by Charles Lindbergh. New York: Cooper Square Press. ISBN 978-0-8154-1028-7. LCCN 2001017080. Astronaut Mike Collins autobiography of his experiences as an astronaut, including his flight aboard Apollo 11.
Cooper, Henry S.F., Jr. (1995) [Originally published 1972; New York: Dial Press]. Thirteen: The Apollo Flight That Failed. Baltimore: Johns Hopkins University Press. ISBN 0-8018-5097-5. LCCN 94039726. OCLC 31375285. Although this book focuses on Apollo 13, it provides a wealth of background information on Apollo technology and procedures. French, Francis; Burgess, Colin (2007). In the Shadow of the Moon: A Challenging Journey to Tranquility, 1965–1969. Foreword by Walter Cunningham. Lincoln: University of Nebraska Press. ISBN 978-0-8032-1128-5. LCCN 2006103047. OCLC 182559769. History of the Apollo program from Apollos 1–11, including many interviews with the Apollo astronauts. Kranz, Gene (2000). Failure is Not an Option: Mission Control from Mercury to Apollo 13 and Beyond. New York: Simon & Schuster. ISBN 0-7432-0079-9. LCCN 00027720. OCLC 43590801. Factual, from the standpoint of a flight controller during the Mercury, Gemini, and Apollo space programs. Lovell, Jim; Kluger, Jeffrey (2000) [Previously published 1994 as Lost Moon]. Apollo 13. Boston: Houghton Mifflin Company. ISBN 0-618-05665-3. LCCN 99089647. OCLC 43118301. Details the flight of Apollo 13. Pellegrino, Charles R.; Stoff, Joshua (1999). Chariots for Apollo: The Untold Story Behind the Race to the Moon. New York: Avon Books. ISBN 0-380-80261-9. OCLC 41579174. Tells Grumman's story of building the lunar modules. Scott, David; Leonov, Alexei; Toomey, Christine (2004). Two Sides of the Moon: Our Story of the Cold War Space Race. Foreword by Neil Armstrong; introduction by Tom Hanks (1st U.S. ed.). New York: Thomas Dunne Books. ISBN 0-312-30865-5. LCCN 2004059381. OCLC 56587777. Seamans, Robert C., Jr. (2005). Project Apollo: The Tough Decisions. Monographs in Aerospace History. Washington, D.C.: NASA. ISBN 0-16-074954-9. LCCN 2005003682. OCLC 64271009. NASA SP-4537. History of the manned space program from September 1, 1960, to January 5, 1968. Slayton, Donald K.; Cassutt, Michael (1995). Deke! : An Autobiography. New York: St. Martin's Press. ISBN 0-312-85918-X. Account of Deke Slayton's life as an astronaut and of his work as chief of the astronaut office, including selection of Apollo crews. Wilhelms, Don E. (1993). To a Rocky Moon: A Geologist's History of Lunar Exploration. Tucson: University of Arizona Press. ISBN 0-8165-1065-2. LCCN 92033228. OCLC 26720457. The history of lunar exploration from a geologist's point of view. Wikimedia Commons has media related to Apollo program. "Apollo Spinoffs". Archived from the original on April 4, 2012. The Apollo Flight Journal by W. David Woods, et al. This page was last edited on 4 April 2019, at 19:11 (UTC).